Development of British Rock 'n' Roll. British Rock and Roll, or sometimes British Rock 'n' Roll, is a style of popular music based on American rock and roll, which emerged in the late 1950s and was popular until the arrival of beat music in 1962. It has generally been considered inferior to the American version of the genre, and made little international or lasting impact. However, it was important in establishing British youth and popular music culture and was a key factor in subsequent developments that led to the British Invasion of the mid-1960s. Since the 1960s some stars of the genre, most notably Cliff Richard, have managed to sustain successful careers and there have been periodic revivals of this form of music. In the 1950s Britain was well placed to receive American rock and roll music and culture. It shared a common language, had been exposed to American culture through the stationing of American troops in the country, and, although not enjoying the same economic prosperity as the US, had many similar social developments, not least of which was the emergence of distinct youth leisure activities and sub-cultures. This was most evident in the rise of the Teddy Boys among working-class youths in London from about 1953, who adopted a version of the Edwardian styles of their grandfather's generation. British audiences were accustomed to American popular music and British musicians had already been influenced by American musical styles, particularly in Trad Jazz, which also exposed some to the precursors of rock and roll, including Boogie Woogie and The Blues. From this emerged the skiffle craze in 1955, led by Lonnie Donegan, whose version of "Rock Island Line" reached the Top 10 in the UK Singles Chart. 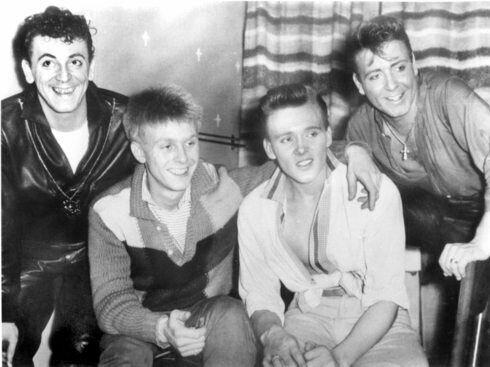 Skiffle produced an Anglicised and largely amateur form of American folk song, chiefly notable for inspiring many individuals to take up music, among them many of the subsequent generation of rock and roll, folk, R&B and beat performers, among them John Lennon and Paul McCartney, who first performed together in the Quarrymen skiffle group in 1957. At the same time British audiences were beginning to encounter American rock and roll. For many this was initially through American films, including Blackboard Jungle (1955) and Rock Around the Clock (1955). Both films contained the Bill Haley & His Comets hit "Rock around the Clock" and helped it to top the UK chart in 1955 and again in 1956. It also set off a moral panic as young cinema goers ripped up seats to dance, which helped identify rock and roll with delinquency and led to it being almost banned by TV and radio stations, making it something of an underground youth movement, which was widely adopted by Teddy Boy Culture. In the 1950s, radio in the UK was almost exclusively in the hands of the BBC. Popular music was only played on the Light Programme, and the playing of records was heavily restricted by "needle time" arrangements. Nevertheless American rock and roll acts became a major force in the UK chart. Elvis Presley reached #2 in the UK chart with "Heartbreak Hotel" in 1956 and had nine more singles in the Top 30 that year. His first #1 was "All Shook Up" in 1957 and there would be more chart-toppers for him and for Buddy Holly and the Crickets and Jerry Lee Lewis in the next two years. The initial response of the British music industry was to attempt to produce exact copies of American records. These were often recorded with session musicians and, even if note perfect, lacked the energy and spontaneity that characterised American rock and roll. They were often fronted by teen idols co-opted an attempt to break into the suddenly emerging youth market. More grassroots British rock and rollers soon began to appear, many of them out of the declining skiffle craze, including Wee Willie Harris (usually credited as the first) and Tommy Steele, who proved the most successful of this first wave, and one of the first to be tagged as "the British Elvis". He reached the Top 20 with "Rock with the Caveman" and #1 with "Singing the Blues" in 1956. Another response was to treat rock and roll as a joke - "Bloodnok's Rock and Roll Call", recorded by The Goons, reached #3 in the chart in late 1956. The bland, jokey, or wholly imitative style of much British rock and roll in this period meant that the American product remained dominant. However, this process was important in the orientation of the British record industry towards the youth market and group based music in general. In 1958 Britain produced its first "authentic" rock and roll song and star, when Cliff Richard and the Drifters reached #2 in the chart with "Move It", which managed to combine a bluesy rock and roll riff with respectable lyrics and attitude. The success of "Move It" was partly due to an appearance on Independent Television's Oh Boy! 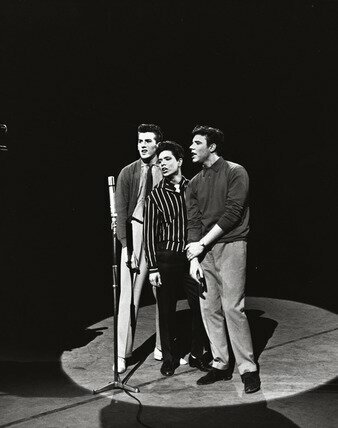 (1958-9), which followed the BBC's tentative first attempt at youth music programming Six-Five Special (1957-58) with a much more music orientated show that did much to promote the careers of British rock and rollers like Marty Wilde, Johnny Gentle, Vince Eager, Adam Faith and Duffy Power. 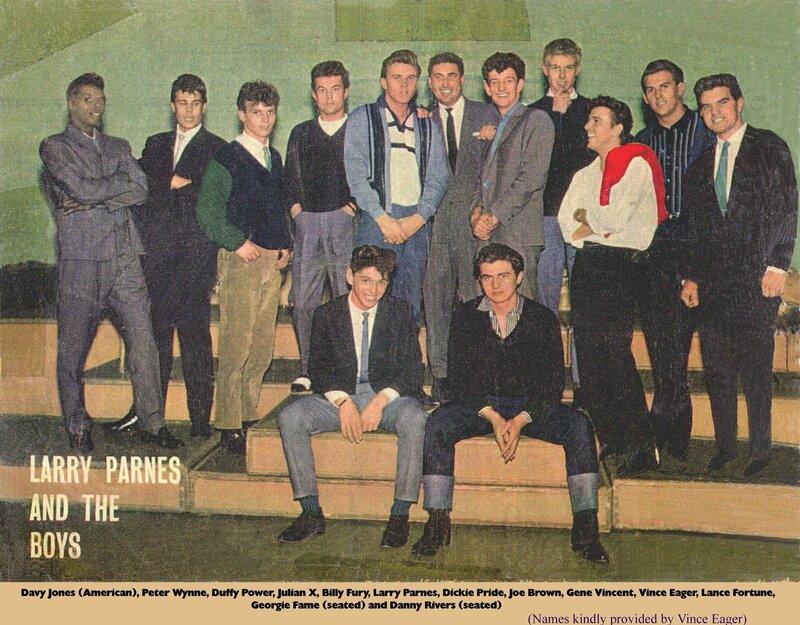 These and other British acts had a series of hits in the late 1950s. Cliff Richard, and as instrumental artists his new backing band The Shadows, were the most successful home grown rock and roll based acts of the era. The Shadows, and particularly guitarist Hank Marvin, were highly influential on a subsequent generation of musicians, helping to cement the line-up of drums, bass, rhythm and lead guitars for British bands. However, in retrospect their work tends to be seen as a bland imitation of American rock and roll. Notably Cliff Richard rapidly dropped much of his sub-Elvis, rock and roll image for a softer mainstream style, as can be seen in his first #1, "Living Doll" and a subsequent series of ballads that owed little to rock and roll. Amid the limited vitality of late 1950s and early 1960s British rock and roll there were some more dynamic acts. 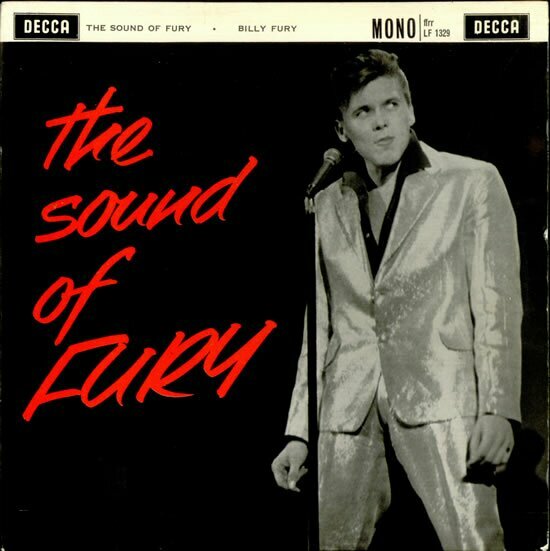 These included Billy Fury, whose rockabilly-style compositions, aided by the guitar of Joe Brown, on his 1960 LP Sound of Fury are considered some of the best work of the era. Tony Sheridan, Vince Taylor, and Screaming Lord Sutch and the Savages also produced some work that could be compared with American rock and roll. The only act to create what has been described as "a pre-Beatle rock classic", were Johnny Kidd & The Pirates, whose song "Shakin' All Over" managed to become a rock and roll standard. British rock and roll declined sharply in the face of the new beat music after 1962. While some of the most successful acts, most notably Cliff Richard, were able to hang on to positions in the chart, British rock and roll virtually disappeared from the chart, as beat and then R&B based groups began to dominate. Many British rock and rollers continued their careers, and occasional bands specialised in the form, but mainstream success for the genre was rare. Early British rock and roll was undoubtedly an inspiration and influence on the instrumentation and shape of the beat music that spearheaded the British Invasion, but it had to be changed significantly into something new and vital in order to have any impact outside of its own borders. During the last few years there has been a new found interest in original British Rock n Roll particularly amongst the British Teddy Boy Movement and other Rock 'n' Roll fans, with the release of many new albums and CD's onto the market. This has resulted in many of the old British Rock n Rollers coming back out of retirement such as Wee Willie Harris. Long may this interest and playing of the music continue.